Happy 1st of October! Now that it’s sweater season, you’re going to need something cute and cozy to decorate your space with. 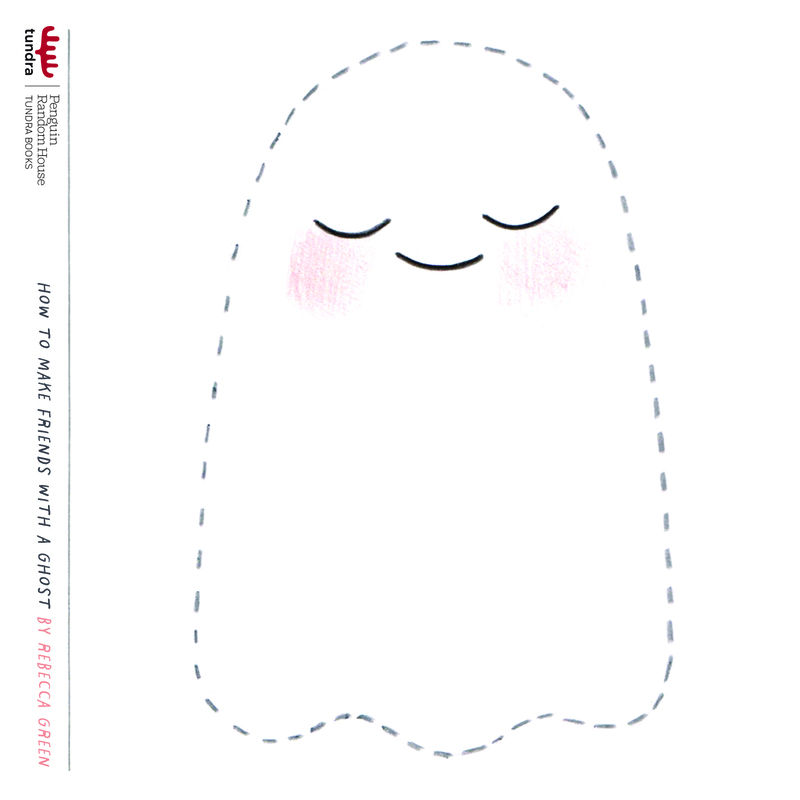 We’re recommending a little felt ghost inspired by How to Make Friends with a Ghost by Rebecca Green. PS: We also have an activity kit and coloring sheets that you can download and print! With Christmas fast approaching, some of you may be scrambling for last minute gifts. Have no fear, we’ve got something for everyone on your list – even if you don’t celebrate Christmas! We were inspired by Travis Jonker’s The Ultimate Children’s Literature Illustrator Gift Guide 2017 over at 100 Scope Notes and decided to show this year’s Tundra illustrators the love. Whether you’re a kid lit fan yourself or just shopping for that art enthusiast in your life, we have something for everyone from some of the best children’s books illustrators out there. Your friends and family will love receiving a book and a piece of art under the tree this year! Colette is exploring her new neighborhood and wants to make friends. But when she encounters someone her age she’s never met before, she doesn’t know what to say—so she hastily invents a lost pet! Things spiral a bit out of control as a neighborhood-wide search party is assembled and Colette makes her pet bird more amazing with each telling. Will the neighborhood kids catch on to her ever-growing fib? This charming story both clearly identifies the struggle of navigating a different experience and demonstrates to kids a lovely and welcoming way to treat someone new in their community. Oliver has always dreamed about where he will fit. Will he be in the mane of a unicorn? The tentacle of a pirate squid? The helmet of an astronaut? When he finally goes in search of his perfect place, he finds that trying to fit in is a lot harder than he thought. But like any puzzle, a little trial and error leads to a solution, and Oliver figures out exactly where he belongs. Where Oliver Fits is a sweet and funny story that explores all the highs and lows of learning to be yourself and shows that fitting in isn’t always the best fit. Santa’s parents think their little one is absolutely wonderful, even though he has a booming voice instead of a baby’s gurgle, loves to stand in front of the refrigerator, gives his birthday presents away, trains his hamsters to pull a matchbox sleigh … and has an unusual interest in chimneys. The adorably funny portrait of an oddball kid who fulfills his destiny – and two very proud parents. The beaver flood has finally frozen–perfect ice, without a bump or a ripple. For the kids in town, it’s Christmas in November. They wait, impatiently, for the right moment. Finally, it arrives: the full moon. They huff and puff through logging trails, farms, back roads and tamarack swamps, the powdery snow soaking pant legs and boots, till they see it–their perfect ice, waiting. When the Moon Comes is steeped in tradition and nostalgia: for hockey, for childhood, for a simpler time. The beauty of the text is matched by the brilliant, rich illustrations that wonderfully capture the magic of a moonlit night in winter. Boo’s favorite chair is little and blue. He sits in it, reads in it and makes a tent around it…until the day he grows too big for it. His mother puts the little blue chair out on the lawn where a truck driver picks it up. The truck driver sells it to a lady in a junk store where it sits for many years until it’s sold and put to use as a plant stand. In the years that follow, the little blue chair is used in many other ways — on an elephant ride, in a contest, on a Ferris wheel, in a tree…until the day it flies away, borne aloft by balloons, and lands in a garden of daffodils where a familiar face finds it. A charming, beautifully illustrated read-aloud that follows the adventures of a little chair, beginning as the seat of a small child who loves books and circling back to that child’s child many years (and bottoms) later. Frankie is a little bear who has a hard time falling asleep. The dark is scary, and he hates to be alone. So his mother gives him a ball of yarn to hold when he goes to bed, and she keeps the other end in the next room, working it into a surprise for Frankie. Every few nights the yarn color changes, and Frankie dreams in all the colors that he and his mother pick out. One night he’s swimming in turquoise water, another night he’s in a cool gray fog. He plays with a marmalade kitten and eats delicious chocolate cake. Eventually Frankie and his mother create something special–and Frankie learns that he’s always connected to those he loves, even when he’s alone in the dark. A beautiful story of love and crafting, A Bedtime Yarn will appeal to knitters, sleepy little bears and any parents dealing with their child’s fear of the dark. At the Story Zoo, you get to tell any story you want in front of the live audience, as long as it’s about you. And tonight is dog night. So sit back, relax, and let these dogs tell their tales. We’ve got some hilarious but quite touching stories from dogs of all kinds, including a bulldog who doesn’t wanted to be judged by his looks; a bloodhound who loses her power of scent and turns to a dog called Surelick Holmes for help; an energetic poodle who saves the day with her yapping; and a stray who takes fetching to a whole new level. These stories will make you laugh, make you cry and maybe even make you howl at the moon. Whether you’re looking for smart, funny, sweet, sharp, silly or just plain fuzzy, The Story Zoo is going to be your new favorite haunt. Warble is a small yellow warbler who lives on the beautiful island of Icyland, where he pursues his hobby of human watching. But on a warm day, a deep fog rolls in and obscures his view. The rest of the birds don’t seem to notice the fog or the other changes Warble observes on the island. The more the fog is ignored, the more it spreads. When a Red-hooded Spectacled Female (Juvenile) appears, Warble discovers that he’s not the only one who notices the fog. Will they be able to find others who can see it too? And is the fog here to stay? Kyo Maclear’s witty story, brought to life with the delicate, misty artwork of Kenard Pak, is a poignant yet humorous reminder of the importance of environmental awareness. A gang of mythical creatures is roaming around a magical land having a great time, until Bigfoot gets his foot stuck in a tree trunk and Unicorn gets her horn impaled on a table and Robot’s saw-arm gets rusted into position. But have no fear! Dad is there to fix things–even when a Sneaky Flying Alligator Pirate steals the Fairy Queen Ballerina Doctor’s wand. A hilarious story about imagination, play and the best parts about being a dad. Our heroine, Renata Wolfman (Wolfie) does everything by herself. Friends just get in the way, and she only has time for facts and reading. But friendship finds her in the form of Livingston Flott (Fly), the slightly weird and wordy boy from next door. Before she knows it, Wolfie is motoring through deep water with Fly as her second in command in a submarine made from a cardboard box. Please join Rebecca Green at Parnassus Books for the launch of her debut picture book, How to Make Friends with a Ghost. Come eat worm tarts and earwax truffles and drink cider! Enter a raffle for a ghostly prize! 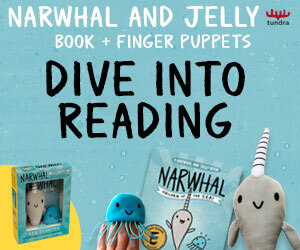 Listen to Rebecca Green read her debut picture book! Get your picture taken with a ghost! Hear a magical tune by Emily Arrow! Ghosts need friends too. Here’s your chance to make a felt ghost in preparation for the arrival of How to Make Friends with a Ghost by Rebecca Green on September 5, 2017. Q: If I already pre-ordered the book, am I still eligible for a gift? A: Yes! As long as you fill in our form between Monday, July 17, 2017 to Sunday, July 23, 2017. Q: Is this only open to Canada and the United States of America? A: Yes, this is for North America only. We are very sorry, international friends! Q: Can I pick between the two gifts? A: Unfortunately, no. We will fulfill the pre-orders as they come in to receive one of the two gifts. Q: What does the “How to Make a Ghost Friend” craft kit include? A: It includes an instruction sheet, a ghost stencil, two white-colored felt patches, a bundle of stuffing, and a needle and thread. You will need to use your own scissors, pink colored pencil, and black permanent marker. Q: What does the READ art print look like? A: It is an 8″ x 8″ card printed on 16 pt uncoated stock. Perfect for framing!